The owner is angry. Extremely. Business is good. Revenues are up. That’s usually what we mean when we say, “Business is good.” But if we look at the whole thing – the big picture – business is in trouble. And this owner knows it. “I’ve never seen this in 26 years,” he says. “It’s incredible. Look at this,” he hands me a stack of complaints. I begin to thumb through them. They all seem fixable. In fact, they seem pretty simple to fix. None of them are complex. Over the next few minutes, I digest them, making mental notes. Except for one – involving a product failure (it happens) – the rest appeared totally preventable on the front end. But I hold my opinion until I make sure I understand what’s happening. We talk about the issues, when things seem to go south and what the owner thinks may be happening. Before I conclude that story, let’s talk about your customer service. It’s the second leg of the trifecta of successful business building. Customer service is really about one major thing – paying close attention. Very close attention. It’s details, details, details. It’s the many little things that irritate customers. Think about your own experiences. We’ve all got plenty of complaints and mostly, they’re things the business could have easily prevented. Customer service is about one other major thing – let’s just focus on these 2 – commitment. How determined are you to dazzle your customers? It shows so don’t tell me you care when my experience is more likely to be lackluster than not. Don’t tell me you care when your customer reviews are filled with 1 and 2 stars and all sorts of negative feedback. You can’t preach one thing and live another. Nobody is buying your sermon. I’ve recently been battling some swimmer’s ear. I figured I’d find an ear, eyes, nose and throat specialist. So I asked another doctor for a recommendation. I contacted that doctor’s office and tried unsuccessfully three times to navigate through the automated phone system. Each time I got to the option of “new patient,” and the phone would then ring, and ring, and ring. One time I let it ring over 30 times. Nobody ever answered. I jumped on their website and used their contact form, telling them I was a new patient trying to get an appointment. Three days later somebody called. Left a voicemail. I returned the call. An automated greeting answered, then promptly disconnected me. I tried two more times. Talk about friction for customers (patients)! I reached out again using the contact form to tell them about my experience. My hope was that the practice manager would see my challenges and help out the doctor, who came recommended. I confess, my hope is very low. I strongly suspect this practice manager isn’t terribly concerned. It’s likely the doctor has plenty of patients. Like so many businesses, where business is GOOD (meaning we’re hitting that first leg of the trifecta), they’re not likely thinking of how much better it could be. It’s not about potential. It’s just about keeping up. Bully for them! The other day my wife and I are wanting to grab lunch. We didn’t want some big, long, drawn-out affair. Just a quick, go in, sit down and enjoy 30-40 minutes. She suggested Panda Express. We’re fans and usually, we get it to go and take it home. But on this day we wanted to go inside. We had somewhere to be a bit later. We get our food, sit down at a table for two. The food is fine. The place is clean. It’s perfectly good. But details matter. In case you’re unfamiliar with Panda Express inside (and I’m not talking about a mall food court location), they have a drink bar where you get plastic forks and napkins from dispensers. About halfway through our lunch, some customer drops a napkin on the floor. These are the things that grab my attention. I can’t help it. I notice the General Manager is in the store. He’s maneuvering around with a clipboard in hand, talking to various team members, one of whom I assume is a manager of some sort. He grabs a small cup and goes to the drink bar to get a drink. I’m thinking, he’ll pick up that napkin. Nope. He goes back toward the register area with his drink, pointing things out to team members. A bit later he and an employee go back over to the drink bar, where he refills his drink. Now we’ve got 2 employees, one of whom is the guy in charge. Surely one of them will pick up this napkin on the floor. Nope. He takes his drink, says goodbye and out the door he goes. The employee goes back to her post. Fifteen minutes pass. Five separate employee interactions with the napkin produce no action. As we’re leaving, my wife and I top off our drinks, put lids on our cups and I tell my wife, “I can’t stand it anymore.” I bend down, pick up the napkin and throw it in the trash. No, I’m not complaining. But I’m pointing out how easily remedied these things are. It’s largely opening our eyes and ears. Paying close attention. I’m going to tell you that MOST businesses don’t do it. Or they don’t do it well consistently. I’m fanatical. I admit it. Years of operating successful retail companies will do that for you. I’d have fired that General Manager on the spot. If you’re blind enough to nearly step on a single napkin occupying the floor in front of you…twice…then you’re not observant enough to work for me. But I’m serious about customer service. Most aren’t. Back to our owner. Do you know what the majority of the complaints were involving? Guess. They weren’t complaining about pricing. They weren’t complaining about rudeness. Almost 80% of the complaints were a lack of follow through. Employees didn’t do what they said they’d do, when they said they’d do it. One complaint was about a product that failed (again, it happens), but when you examined it more closely…that really wasn’t the complaint. The complaint was the employee took too long to make it right. The customer had to jump through hoops like I did trying to make the doctor appointment. 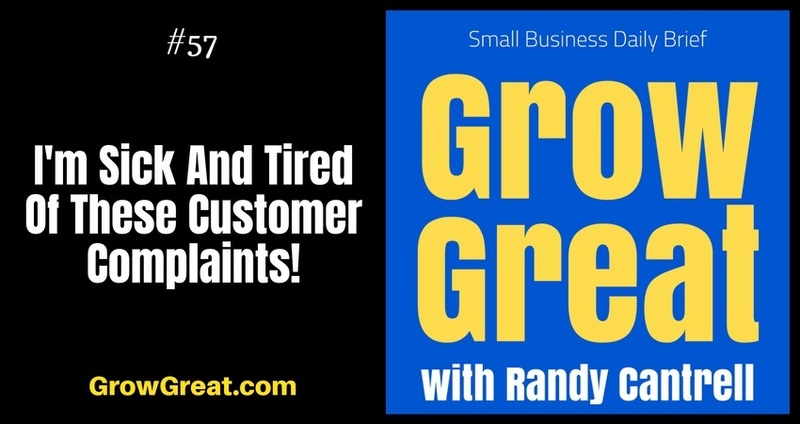 Here was a prime opportunity to really dazzle a customer (in an upcoming episode we’ll talk about how valuable the opportunity is when a customer has a problem), blown. The rest of the complaints were what I’ll call “nobody cares” complaints. Things like phones not being answered. Or not answered promptly. Emails were not replied to. Simple matters of neglect. The good news is 100% of these problems were easily fixed. Simple really. The bad news is that the owner had inadvertently generated big problems inside his company. He structured a bonus program based on revenues with a manager who was driving sales as hard as he could. Like a Pony Express rider, the manager was riding this horse for all it was worth. Happy to put the horse down at the end of the quarter when he’d collect his fat bonus. His bonus didn’t hinge on another other than driving up sales. It was completely the owner’s fault. And his responsibility. Be careful what you wish for. Be more careful what you reward. As business increased, so did the complaints. The owner was wisely now fretting over the company’s reputation. Social media reviews were hammering his company like never before. He was experienced enough and smart enough to know sales wouldn’t remain good unless he fixed this problem. So he finally got sick and tired enough to try to figure out how to fix it. What about you? When will you get sick and tired of it? And if you’re getting complaints, be thankful. Most customers just leave without saying a word. Or they go online to slam your company. It’s not an overstatement to say that if you’re not fanatical about customer service then you’re not doing it right.